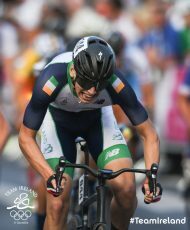 Team Ireland’s Rhasidat Adekele secured Ireland’s fourth medal of this year’s European Youth Olympics Festival today with further success throughout the day including two personal bests achieved and two top ten’s in cycling. Ireland’s Julia Knox swam a personal best in the heats of the 100m Butterfly (1:05.78). Despite winning her heat, Knox was placed 37th overall, missing out on a spot in the Semi-Final. In the 100m Freestyle Sean McNicholl touched in 53.47 seconds to come 33rd while Naomi Trait (27.94) was placed 45th and Scarlett Armstrong (28.08) placed 49th in the 50m Freestyle. Team Ireland Cyclist, Maeve Gallagher placed 8th in the Girls Road Race with a time of 01:08:21 while team mate Lara Gillespie placed 18th in a time of 01:08:21. Unfortunately, Team Ireland’s Caoimhe O’Brien was involved in a small accident on the road, leaving her in 60th place with a time of 01:11:34. Shay Donley also finished 8th in the Boy’s Road Race with a time of 1.37.54 with team-mates Cathir Doyle and Mark Smith also finished strong, in 43rd and 69th place respectively. Day Five at EYOF will see an array of action in the Swimming heats first thing with Sean Scannell in 200m Backstroke, Mia Davidson and Julia Knox in the 200m Breastroke, Ethan Murtagh in the 200m Butterfly, Cara Osing and Naoimi Trait will swim in the 200m Freestyle with the Boy’s and Girls 400m Medley Relay taking place in the morning also. Athletics action will include the Women’s 400m Hurdle final with Miriam Daly inaction as well as the Women’s and Men’s 4×100 and the Men’s 800m Semi-final.